There's more to December than frost and rain (or their lack). Winter offers opportunities in the garden as well. On a recent December morning, I wandered out to the vegetable patch to see how the broccoli plants were faring. I started these plants from seed in early September and transplanted them into the ground on September 26. Initially I covered them with wire cages to keep birds from shredding them, but lately the plants have outgrown the cages and I wanted to see if they were being eaten. Birds are nibbling, but the plants are starting to form heads and I am hoping that we'll soon be eating home-grown broccoli. I noted in my garden journal that if I want broccoli for Thanksgiving, I need to set plants out in August. I also checked the lettuce to see if there is anything left to harvest. This bed was seeded in August, and we have been eating salad greens for a couple of months. The plants are fairly bedraggled now, but a surprise was waiting for me in the garden path. Recent rains have provided enough moisture to sprout some arugula from a spring crop that went to seed. If the arugula weren't edible, I'd consider it a weed. Already the plants have one- to two-inch leaves, just right for salads and pizza topping. If arugula seeds can sprout in December, you know other edibles will grow. Try planting fava bean, parsley, radish and spinach seeds. If you can find nursery seedlings, you could also set out kale, broccoli, lettuce, chard and other greens. Everything grows slowly now, but you can expect some delicious eating in February and March. It's not too late to set out garlic. If you can't find garlic in nurseries, try organic garlic from the grocery store. Planted now, it will not mature until late May or June, but you can harvest green garlic at any stage. It's also not too late to set out a few annual flowers for color. Check a local nursery to see what is available. I have a fondness for pansies and violas and usually set out a few plants in the winter vegetable patch. They add color to the beds and to my salads, too. The peach and apple trees in my yard have lost nearly all their leaves. This leaf drop signals the start of pruning season for deciduous trees, roses and grapes. Remove diseased or damaged branches first. Then assess the tree from all directions before pruning for shape and fruit production. Some trees, including many apple varieties, produce fruit on spurs (short stubby twigs) over many years, while other fruit trees produce fruit on new shoots every spring. Since this influences the way these trees should be pruned, consult a book, a tree expert, or Napa County Master Gardeners (office hours below) if you are not sure. For ornamental trees, prune mostly for shape. If I waited for the roses in my garden to lose their leaves, I might never prune them. Go ahead and startcutting them back now. You will be rewarded with healthier plants and more blossoms next spring and summer. One of my neighbors has a lovely Fuyu persimmon tree in the front yard just dripping with ripe fruit. I have found myself wishing I had my own share of those persimmons. Luckily, bare-root planting season has now begun. Plants sold in the bare-root state include deciduous fruit and shade trees; roses; vines such as clematis, wisteria and grapes; flowering shrubs such as lilacs and berries, including cane berries, blueberries and strawberries; and the perennial vegetables artichokes and rhubarb. The plants are field grown by the propagator, dug up while dormant and sold without soil clinging to their roots. Consequently, they are easier to handle than plants in pots and usually quite a bit less expensive. If you have found yourself coveting your neighbor's unpicked fruit tree, it might be time to plant your own. Local nurseries will have their largest supply of bare-root plants in January, but now is a great time to order by mail. 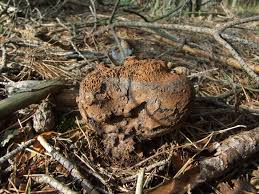 Bare-root plants need to go into the ground as soon as possible to protect the roots from dying out. If possible, prepare planting holes during a spell of dry weather so they are ready when you bring the plants home. If your soil is too wet for immediate planting, “heel in” the roots temporarily in damp compost or sand in a shady location. Cover the planting area to let it dry out a bit. 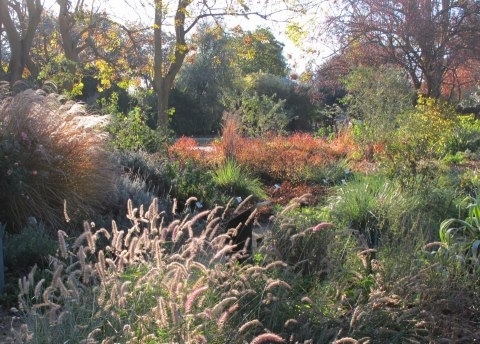 Whatever the December weather, you can spend some time in the garden. Maybe you will find some pleasant surprises there. Workshop: U. C. Master Gardeners of Napa County will host a workshop on “Fruit Tree Pruning and Care” on Saturday, January 16, from 9:30 a.m. to 2 p.m. The workshop includes a lecture session from 9:30 a.m. to 11:30 a.m. at the University of California Cooperative Extension office, 1710 Soscol Avenue, Napa. A hands-on session follows from 12:30 p.m. to 2 p.m. at Silverado Middle School, 1108 Coombsville Road, Napa. On-line registration (credit card only) coming soon; Mail-in/Walk-in registration (cash or check only). If you are going to plant bare-root fruit trees in January and February, it is time to start planning. If I had it to do over in my own garden, I would use the espalier method. Espaliered fruit trees take much less room in your garden, a big plus if you have only a small space for trees. What's more, espaliered trees—grown on a trellis, like wine grapes—can act like a wall to create different spaces in your landscape. The espalier technique was developed centuries ago in France. Gardeners there used rope to shape fruit trees and found that the trees produced a good crop. It seems that limbs trained horizontally produce more fruit than branches pointed up. However,the method does take more work and planning than an orchard layout. Dwarf figs, apples, pears and citrus are the most common fruit trees grown as espalier. Other fruit trees are more difficult to train in this way. You can espalier a tree against a wall unless you are in a very warm climate. In that case, the heat reflected by the wall might cause fruit and leaves to burn. You will need to set up a trellis system on which the trees can grow. Be sure to leave enough space to move behind the trees so you can prune them easily. Then you need to install posts tall enough to support the mature trees. Seven to eight feet is suggested. Place the first wire about three feet above the ground and then one foot apart after that. At the nursery, select trees with lots of branching. You are going to cut off most of the branches and direct the remainder along the trellis wire. If you can't find such a tree, start with a whip (a young, slender, non-branching trunk).Another alternative is to prune off all the trunk's branches and direct the new, flexible growth along the wires. The espalier method is not something you do once to each tree and then you're done. Itis a process. It involves constant training and pruning to get branches growing in the right direction. I suggest purchasing bare-root fruit trees because they are much less expensive than container trees.When you plant them for espalier, you use the same methods that apply to any bare-root tree. Site the trees close to the trelliswith at least six feet between each tree. Dig a hole wide and deep enough to accommodate all the roots. You can prune some of the root tips off before planting.Create a mound inside the planting hole. Set the tree on the mound and spread the roots evenly around, then take a look. Make sure that when you back fill the planting hole, the tree is no deeper than it was before. 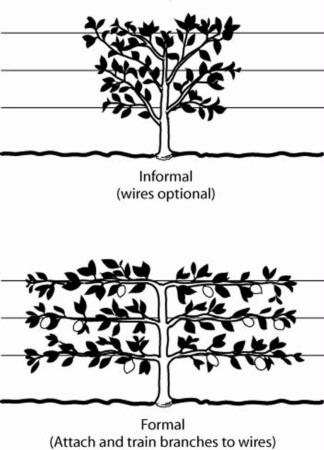 Be sure the graft union (where the scion is grafted to the rootstock) is above the soil line. Remove the tree and water the hole well. Then place the tree on the mound again and refill the hole with soil. Water again. You want the soil to go into all the nooks and crannies. Stomp on the soil to compact it. Trim all branches that you cannot easily train to the wire. Tie branches to the wire with a plastic tie. Trim back the growing tip to buds coming out the sides at the next highest wire. You will need to continue this training throughout the life of your fruit trees. There is ‘Wonderful', and there is ‘Early Wonderful'. Which one you choose depends on how long you can bear to wait for the first pomegranate of the season. ‘Wonderful' is the pomegranate most of us pick up at the grocery store. Originally found in a bundle of cuttings from Florida, ‘Wonderful' has been propagated widely in California since the early 1900s. But the story of pomegranates (Punicagranatum) goes back much further. Also called Chinese apples, pomegranates are one of the oldest documented edible fruits. They require long, hot summers and can survive under myriad conditions. For best fruit production in Napa Valley, plant pomegranates in a sunny location in ordinary soil with good drainage. For the first two years, water deeply every two to four weeks in dry weather to encourage root establishment and fruit production. When pomegranate plants are about two feet high, select four or five of the healthiest-looking branches, preferably well-spaced, and cut them back to 12 inches.Remove the remaining growth and any shoots or suckers that appear above or below these chosen branches. Pomegranate trees can be grown as dwarfs, but most reach 15 to 20 feet tall. Disciplined pruning can keep them tidy in smaller spaces. 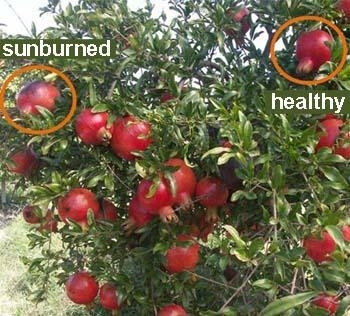 The pomegranate produces fruit at the end of new growth. Judicious pruning annually for the first three years will produce bushy plants with abundant new growth each year. With their shiny, dark leaves, bright orange flowers and dramatic red fruits, pomegranates make attractive, long-lived additions to the garden. Their ruby arils—the pulp-covered seeds—are beautiful in salads and make a refreshing juice. The fruit is also used commercially for making grenadine, the sweet red syrup in a Shirley Temple. Local birds appreciate any fruit left on the tree. No wonder the Spanish missionaries considered pomegranates essential to propagate along El Camino Real in the 1700s. Pomegranates are still often found on old homesteads and in historic gardens across the state. By 1927 California boasted 2,750 acres of pomegranates. As of 2011, the last year the USDA tracked commercial production, California had more than 30,000 acres of pomegranate orchards. Some fruit trees, like plums, are susceptible to oak-root rot and can't be grown near diseased oak trees. Fortunately, pomegranates do not have this issue. Sometimes the pomegranate rind splits, exposing the seeds to insects, moisture and mold. Regular watering minimizes splitting, as it does for tomatoes and other fruits. Cease watering two to three weeks before your anticipated harvest. Allow pomegranates to ripen fully on the tree as they won't ripen further after harvest. Clip the stem to avoid damaging the fruit; do not pull the fruit off the stem. Pomegranates actually improve in storage, becoming juicier and more flavorful. Keep the fruit cool but not cold. A temperature below 41°Fwill turnred arils pale and promote decay. Stored at the proper temperature and around 85% humidity,the fruit can last for up to seven months. When the arilsstart to fade and look streaky, flavor fades, too, and it is time to put the fruit in the compost. Pomegranate seeds germinate readily, but you may not get a high-quality tree from seed. Most pomegranates are propagated from rooted cuttings. 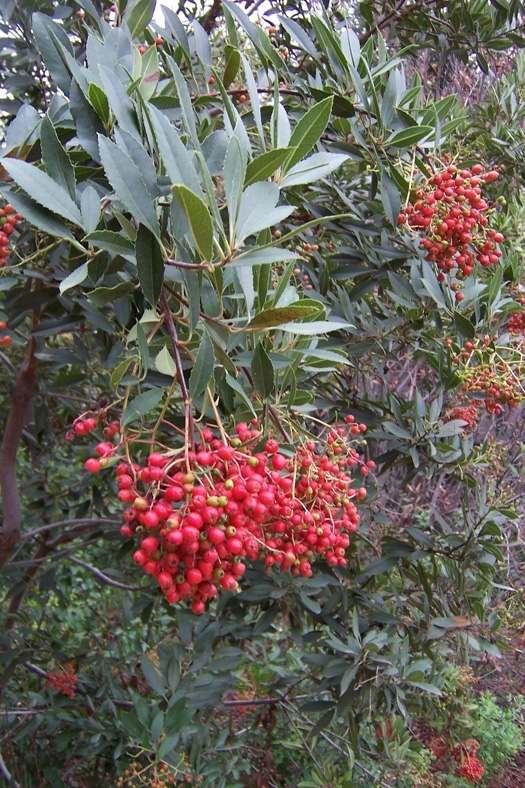 A few years ago, University of California Extension fruit-tree specialists Paul Vossen and Deborah Silver published a paper recommending pomegranate varieties for our area (http://home orchard.ucdavis.edu/plant_pomegranate.pdf). They describe ‘Wonderful' as producing large, deep-red fruits with juicy red arils, small seeds and good flavor. Vossen and Silver also suggest ‘Grenada' and ‘Eversweet' for a harvest that begins in August instead of September. And if you have space for only one? Taste different varieties to find your favorite. The good news is that even ordinary pomegranates from your grocer's shelf can be Wonderful. Workshop: U. C. Master Gardeners of Napa County will host a workshop on “Making Wreaths from Your Garden” on Sunday, December 6, from 2 p.m. to 4 p.m., at Yountville Community Center, 6516 Washington Street, Yountville. Learn what plants from your garden will make good wreaths and how to choose and prepare plant materials to make them last a long time. Get tips and tricks for designing and making easy creative wreaths for the holidays or any time. Each participant will create a wreath to take home, using locally collected plant materials and supplies provided. To register, call the Parks and Recreation Department at 707-944-8712 or visit its web site.